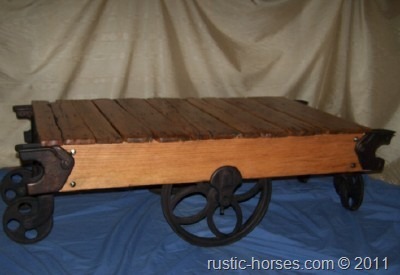 Factory carts are a piece of American History and this one has been restored for use in YOUR HOME! 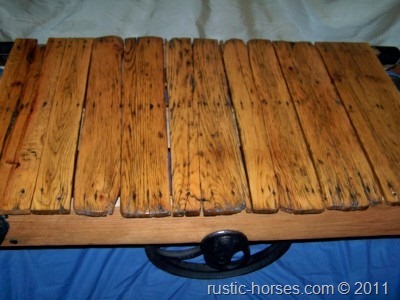 They make great coffee tables or occasional tables. 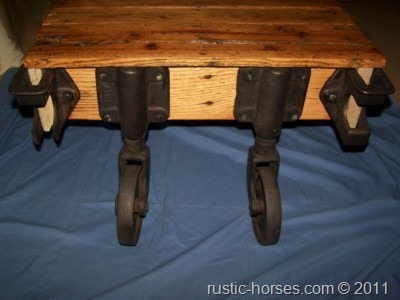 What items will you place on the top of this great table? 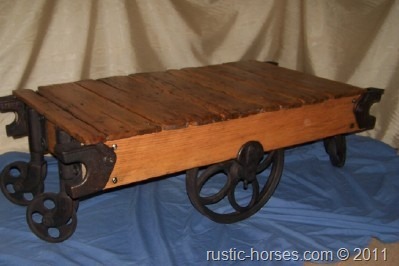 These antique factory cart coffee tables look great in any setting. 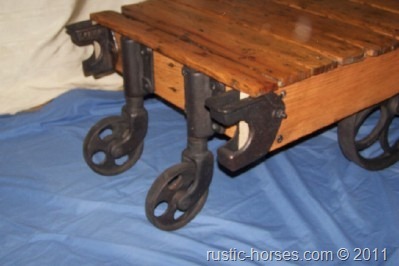 This actual cart was once used in a factory right here in America in the early 1900’s to move items from one place in the factory to another. It could have been used to move furniture or maybe fabrics. This cart and all the carts we restore are over 100 years old. They come from several different manufacturers, such as Lineberry and others. 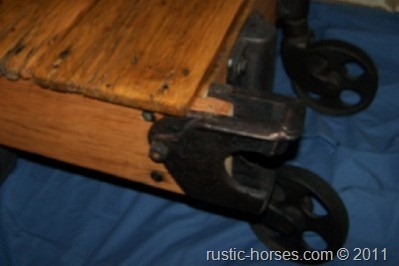 The wheels and brackets sometimes have a name on them. This is the authentic real deal it is NOT a reproduction. 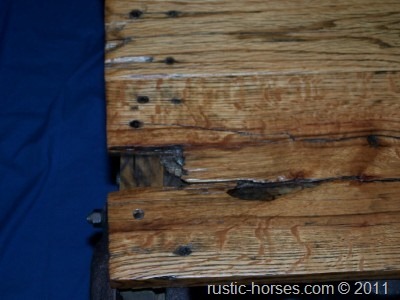 We restore by taking it apart and plane-ing and refinishing the wood, and cleaning, sanding and repainting all the metal. Even the original nails were used. It was reassembled EXACTLY the way it was originally built. The body of it is wood, and authentically well used, the hardware and wheels, are cast iron and we have restored the wheels to a oil-rubbed bronze look. This one is ALL original and we are asking $595 for it. Other places such as RestorationHardware.com asks hundreds more, and in my opinion ours is nicer . They have been proudly displayed in magazines such as Coastal Living, Southern Living, and the cover of March 09′ Total Beach House Magazine. 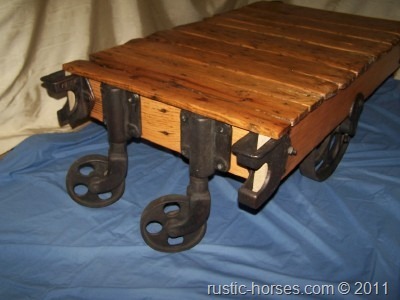 We think these are a great addition to our rustic furniture line. We have others we will be adding but not all of them have all the original parts. Some will be priced less. If this is the one you like, don’t hesitate because it is a one of a kind, no two are exactly alike.